Since 1999, InterCoastal Net Designs (ICND) has been serving our clients website development and digital marketing needs. Our team is here to help you build a website and marketing plan catered to your vacation rental company. Customization, independence, seamless integration. Our design capabilities and integrations with Barefoot make ICND an easy choice for Barefoot clientele. However, our services don’t start and end with your website launch. We have in-house digital marketing, client success and project management teams to assist with building your online brand. ICND works well with Barefoot Technologies to develop a website that is fully integrated with your property management system. The Barefoot team presents ICND with all the data we need to ensure a smooth online booking process that is SEO friendly! To learn more about what a booking engine integration is, click here. Our custom designed websites are built to represent you and your brand. We provide complete independence for your online presence with an ICND vacation rental website! View some of our work by clicking here. vacation rental marketplace has grown. A few years after our launch ICND also jumped in to assist us with our SEO and have truly launched us from “just another company” on the internet to THE primary search result when searching in our market for a vacation rental manager. Their support team is always on it, quick to respond and resolve issues every time we need them. 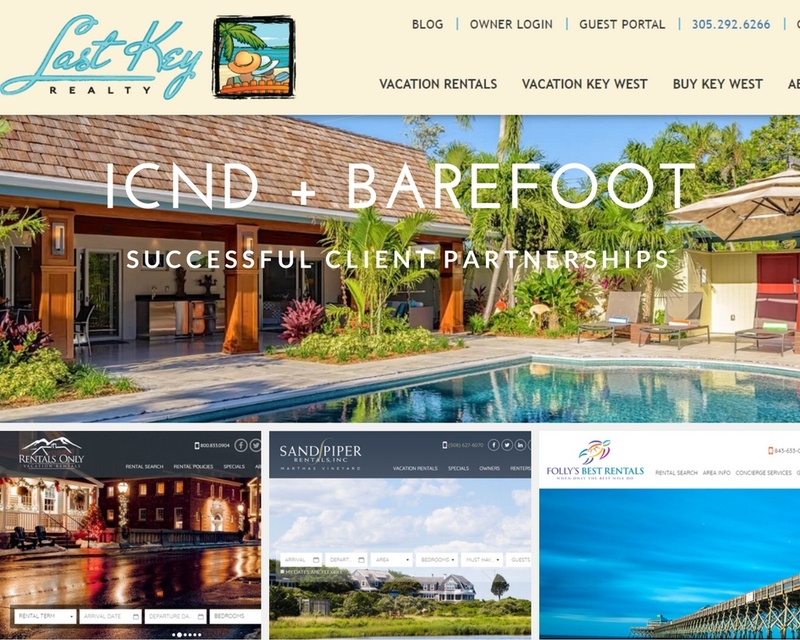 We are so thrilled with ICND as a company and the people that we get to partner with to make our web presence a true representation of the quality of company we are in person here in Key West. Thank you to the whole ICND team for helping us over the years - we could not imagine doing business without you!"